the nytpicker: Clark Hoyt Forgets To Mention That NYT Ran Faked Iranian Missiles Photo, Too. Clark Hoyt Forgets To Mention That NYT Ran Faked Iranian Missiles Photo, Too. 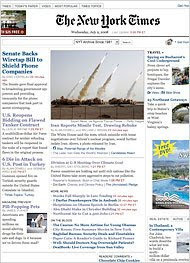 In it, Clark Hoyt credited a Times photo editor, Patrick Witty,with having exposed as fake a photograph of Iranian missiles that duped other newspapers. But Hoyt's column conveniently forgets to mention that the photo initially duped the Times, too. "Last summer, Witty unmasked as a fake a photo of an Iranian missile test that ran on many other front pages," Hoyt wrote. A reader is likely to infer that the Times never printed the photo. But had Hoyt really not read the Times's web posting about the photo on July 10, 2008? There the paper openly disclosed that the faked photograph appeared not only on the print front pages of several major newspapers, but also on the front page of the Times's own website, and thus seen by hundreds of thousands of Times readers. The Times was honest enough to acknowledge this fact back in July. Why didn't Hoyt feel it necessary to admit, six months later, that the Times had been duped along with everyone else? Kudos to Witty for catching it before it landed in the newspaper, but the omission by Hoyt demonstrates his ongoing desire to cast his employer in the most positive light possible -- regardless of the facts.